Despite big hits from Kollywood, 2013 was really the year of the box-office bomb. This year, Tamil film industry has witnessed several hit films that mostly stars big actors in the likes of Kamal Haasan, Suriya and Ajith. Interestingly, a few small budget films starring lesser known actors have also clicked with the audience. From "Vishwaroopam" to "Arrambam", check out the list of biggest grossing Tamil films of 2013. According to statistics, Viswaroopam has made 300 crores in India and globally. The movie is also one of the biggest hits of the year. Kamal Haasan's spy thriller "Vishwaroopam" faced release issues in Tamil Nadu. Despite a delay in release, "Vishwaroopam" managed to attract audiences and earned big bucks at the box office. The film was appreciated for its technical brilliance as well as Kamal Haasan's performance. The film, reportedly made on a budget of ₹95 crore, grossed over ₹200 crore at the worldwide box office, according to Press Trust of India. Kamal is making a sequel to "Vishwaroopam." The film titled "Vishwaroopam 2" is all set to hit the screens next year. Ajith's Arrambam ranks second as the highest grossing film of the year. It has collected 100 crores in returns. Ajith's "Arrambam", which released on 31 October, turned out to be one of the biggest hits of 2013. The film has grossed approximately ₹80 crore in three weeks at the worldwide box office. Recently, the stylish action film completed 50-day theatrical run at the box office and is still running in some theatres across Tamil Nadu. The Telugu version of the film titled "Aata Arrambam" released more than a month after the Tamil version release. Still, the Telugu dubbed version managed to do average business and performed better than a few direct Telugu releases. Ajith is gearing up for his next big release -"Veeram" - which is set to hit the screens in January, 2014. The sequel to Singham, Singham II made about 63 crores. "Singam 2" is a sequel to 2010-blockbuster flick "Singam." The sequel, which released in July this year, took the box office by storm raking in fantastic collections. The Suriya starrer, which was reportedly made at a budget of ₹45 crore, had grossed over ₹100 crore at the worldwide box office, some reports say. The success of "Singam 2" has made fans appeal for another film in the franchise. However, director Hari and Suriya are currently busy with their new projects. It remains to be seen as to whether the director-actor duo will come up with the third installment in the "Singam" franchise. The low budget flick Varuthapadatha Valibar Sangham made an enviable 60 crores. Varuthapadatha Valibar Sangam got the biggest opening in Sivakarthikeyan's career. It earned approximately INR 4.55 crore net on the first day of its release. The film, which released in 343 screens in Tamil Nadu, took INR 14.25 Cr in its first three days and had collected INR 31.5 Cr after 17 days at the Tamil Nadu box office. The film collected worldwide INR 71.7 crores, says some report. VVS grossed Rs. 97.66 lakhs ($127,800) on 23 screens in its opening weekend in USA box office as reported. It has completed 100 days successfully in many theatres. The romance Raja Rani that was also Nayan's come back made 55 crores. Arya-Nayanthara's "Raja Rani" received good response from critics as well as from the audience. Director Atlee was appreciated for giving out a clean family entertainer. The performances of the lead actors including Jai and Nazriya were appreciated by fans. "Raja Rani" reportedly earned ₹50 crore in just 25 days at the worldwide box office. Another low budget success Soodhu Kavvum made 55 crores. Wiki: Soodhu Kavvum grossed 8.38 on first day.The film collected over 79 crore worldwide (unofficial reports) which is 5 times that of its budget and was declared a blockbuster at the Box office.It has successfully completed 100 days. The comedy entertainer Theeya Vela Seyyanum Kumaru netted 50 crores. Wiki: The film good start at the box office collected 10 crore in first week itself and in telugu film gross 2.60 crore Total 12.60 crore at the box office. The positive word of mouth helped the film. The film rocked at the box office grossed over 60 crore in tamil 6 weeks and telugu 11.22 crore Total Worldwide gross 71.22 crore at the box office.The film declared "Super Hit" at the box office in tamil.The film is most successful film in 2013. The film completed 50 days in 10 centers. Vishal's debut production venture made more than double of its production value - 50 crores. Wiki: The film collected ₹38.12 lakh from 156 shows in its opening weekend in Chennai. After seven weeks, the total collections at the Chennai box office were estimated at ₹3.81 crores. While Tamil Version collected 100 crore despite of other big releases. The film completed successfully 50 days. The Telugu version Palnadu collected 3.2 crore on the first day. The film first weekend collected 10 crore. Telugu Version total collection worldwide 40 crore at the box office. The film both version collection adding up to 140 crore at the box office. Ethir Neechal made 40 crores and stood as a successful venture for the producers. The film opened 80 – 90% occupancy on first day collected 4 crore.The film total collection is 30+ crore. The comedy super hit with Santhanam and Powerstar in lead roles Kanna Laddu Thinna Asaya raked in 35 crores in returns. Wiki: KLTA opened tremendous 95 - 100% ocupancy on first day collected 20.99 crore at the box office. The film highest opener in 2013.The film is top in 4 weeks at the box office.The film first week collection is 84.99 crore at the box office. The film domestic gross 158 crore and worldwide gross 202 crore at the box office. The film occupied first place for Pongal race winner.The film was declared a super hit at the box office. Kedi Billa Killadi Ranga, Desingu Raja, Udhayam NH4, Vanakkam Chennai, Idarkkuthaane Asaipattai Balakumara are a few other commercially successful films. 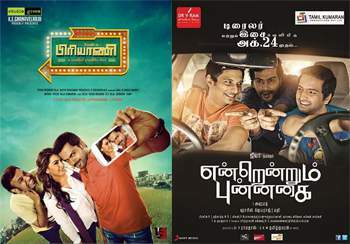 Biriyani, Endrendrum Punnagai and Ivan Vera Maadiri are showing promising signs but not added since they have only been released recently and are likely to have a longer shelf life.